Sometimes you need to pull a rabbit out of your hat. On occasion you find that what you pulled out actually was more like a weasel or a marmot, but now and then it does turn out to be a rabbit, just as you’d hoped. I’m preparing food for a cocktail party, which has to be all finger foods. I thought Asian chicken lettuce wraps would be good, never mind that I have never made them before. The filling part is easy enough – diced chicken, water chestnuts, peanuts, cilantro, scallions – but the dressing was another story. You can buy all kinds of bottled dressings and some of them taste okay, but it’s fun to mix your own. If you have a well-stocked pantry with Asian ingredients, it’s fast and easy. Here is what I came up with. This started with a recipe for Vietnamese Chicken and Mint Salad from Nigella Bites by Nigella Lawson, and took off from there. Combine all ingredients. Store in refrigerator. Remove star anise before using. Toss with diced chicken or shrimp for Asian lettuce wraps or as a salad dressing. Use chili flakes, Sriracha, cayenne, or other hot peppers in place of the Jalapenos. Nam pla (fish sauce) is available in Asian markets or well-stocked supermarkets. If necessary you can substitute soy sauce or tamari. Black bean garlic sauce is available in Asian markets or well-stocked supermarkets. Leave it out if you can’t find it. 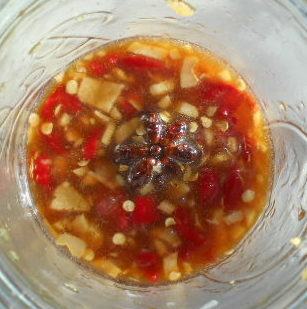 Thai sweet chili sauce is available in Asian markets, supermarkets, and Trader Joe’s. It is a thick sweet-spicy sauce that has a couple of million uses. 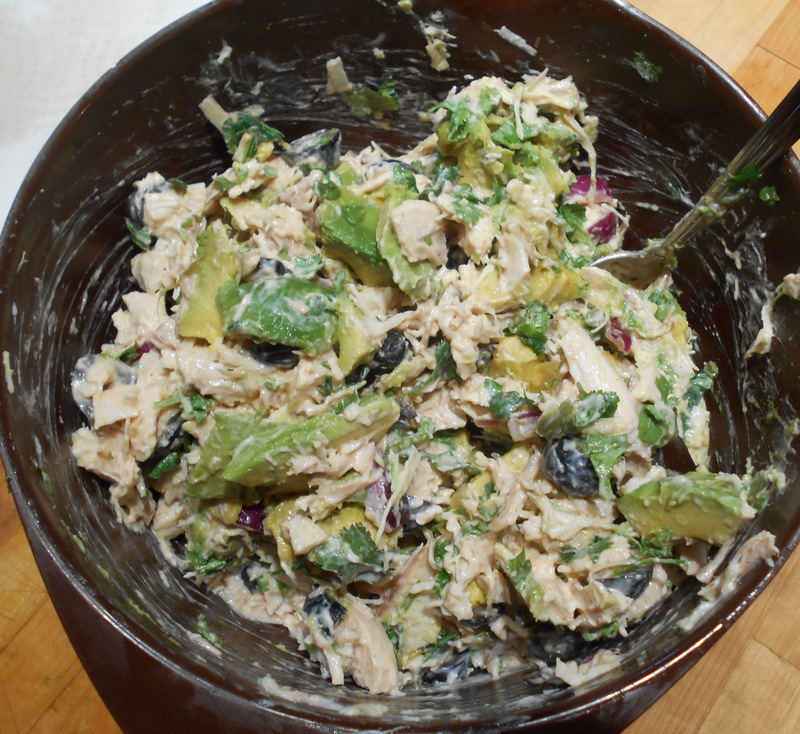 Posted in recipe and tagged Asian, chicken, dip, gluten free, salad dressing, sauce, vegan, vegetarian. Bookmark the permalink. 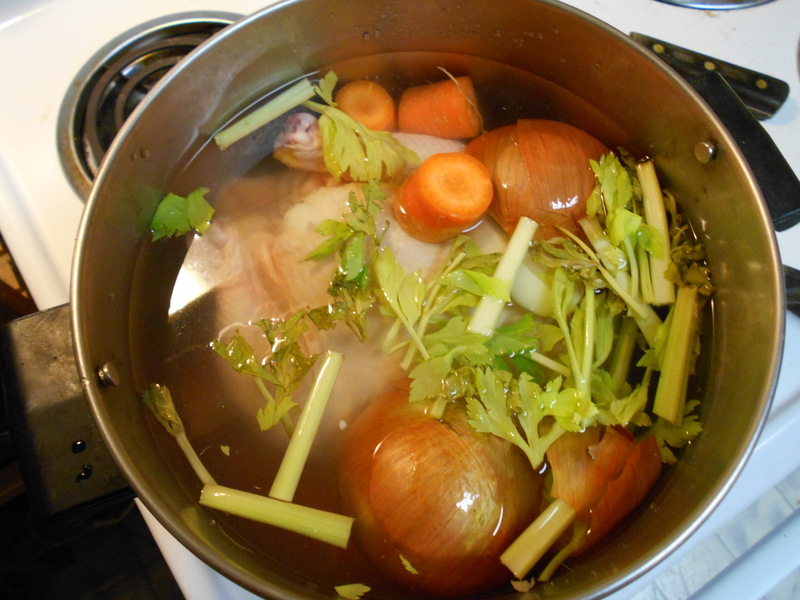 In the last post I talked about poaching chicken and having a lovely broth or stock left over as a result. Great stuff to have on hand to stir into sauces and make soup from – it’s a staple in my kitchen. 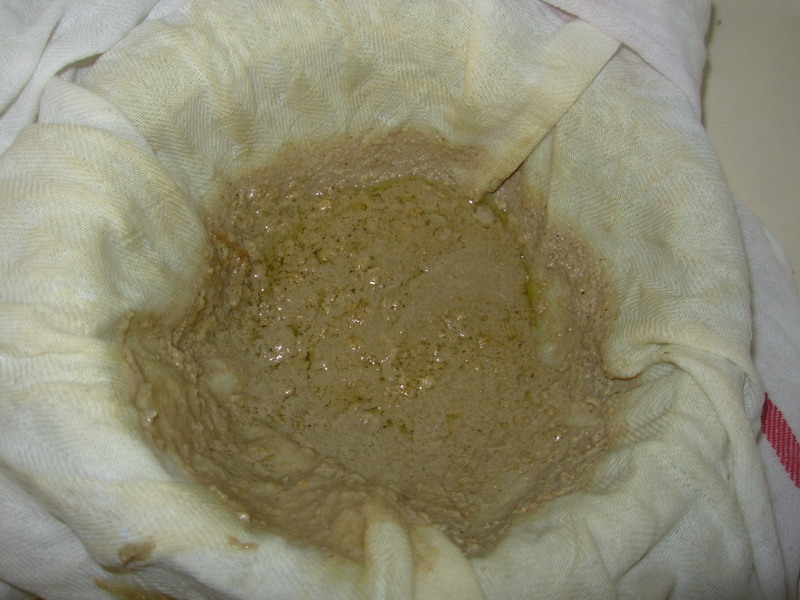 The fat rises to the top when it is chilled and it’s ready to go. Anyway. 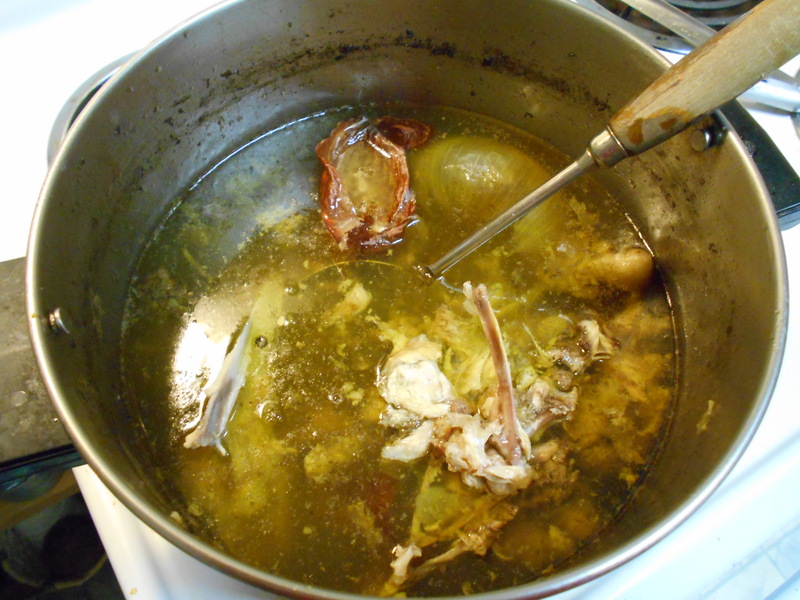 To clarify stock that’s muddled and cloudy, heat the strained -of-bones-and-veg stock to simmering. While it’s heating, for each quart of stock (more or less; you don’t need to be precise) beat one egg white until thick and puffy. Now: whisk that fluffy egg white into the simmering stock. Stir it around a time or two, then turn the heat UP and bring the stock to a boil. Immediately turn the heat OFF again, remove the pan from the heat, and let cool to warm-ish. The nice white egg white will start to look like four-day-old New York snow. Now get a clean dish towel – not a terry-cloth one, unless you enjoy chewy bits in your broth – and dampen it, then wring it out. 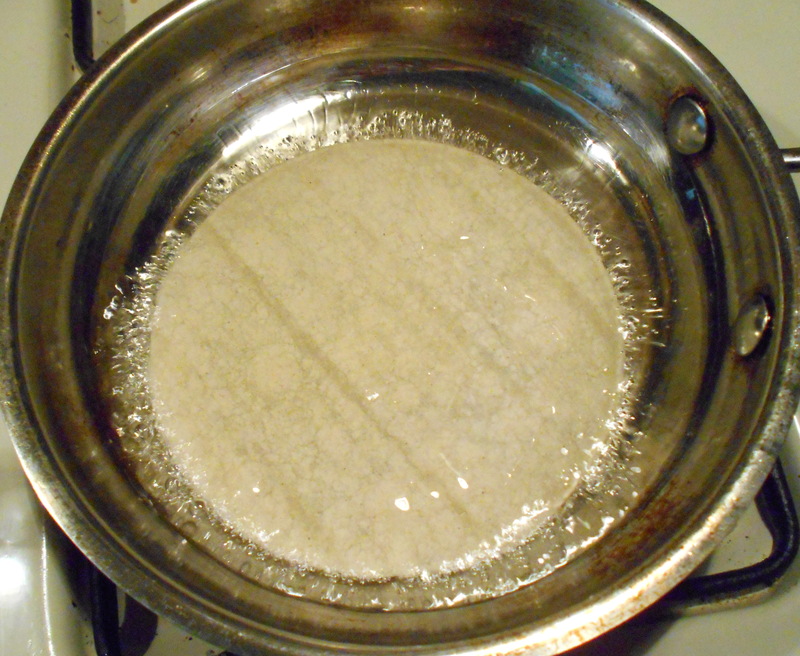 Place the towel over a wire-mesh strainer and place that over a bowl, and pour the stock-egg mixture into the towel. Let it drain. DO NOT DISTURB THIS. 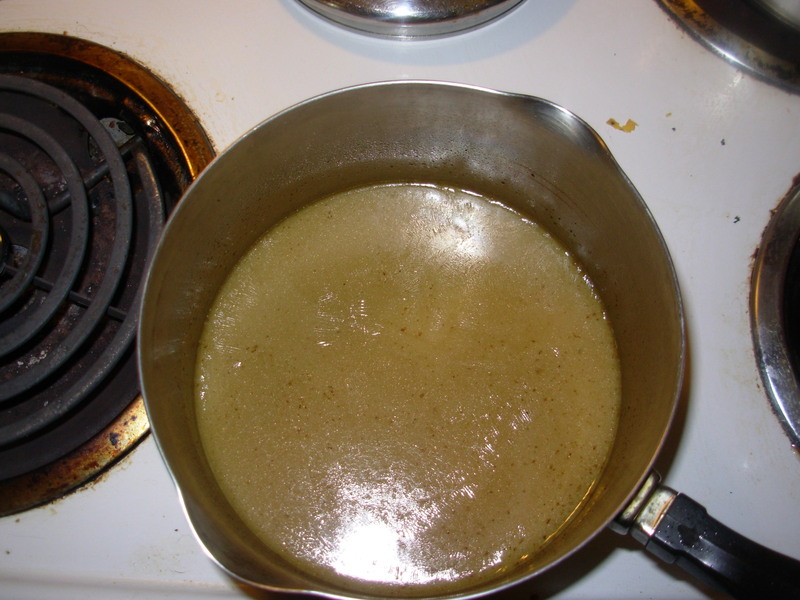 If you try to hurry it by shaking the strainer or pressing on the towel, you will get cloudy gunk in the broth, so LEAVE IT ALONE. Store, covered, in the refrigerator about four days. 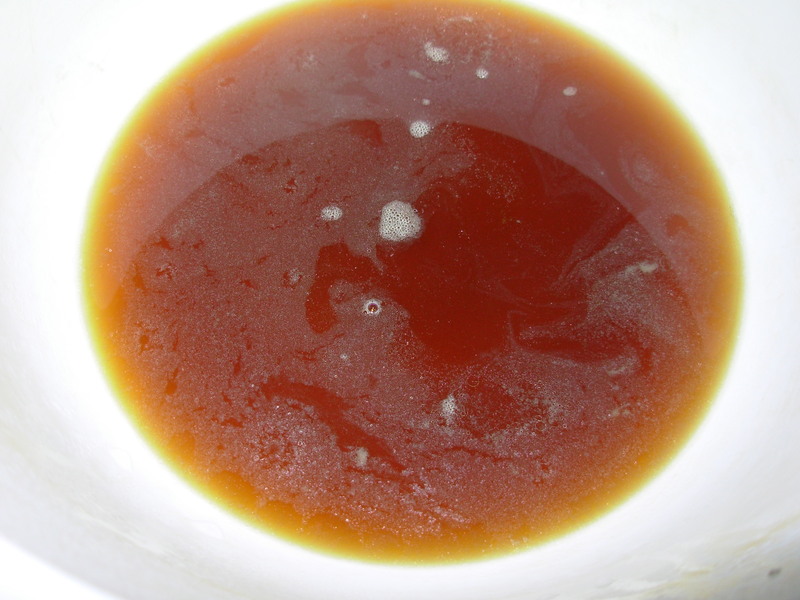 This method works on any meat stock – chicken, beef, pork, lamb, whatever – and makes a sediment-y stock into a much more appetizing soup by itself. Posted in pantry, recipe and tagged broth, chicken, gluten free, stock, technique. Bookmark the permalink. For some years now I’ve been working on my roast chicken technique. For a while I tried roasting at a low (325F/162C) temperature, and the results were good, but it took forever to get done. I tried roasting it at 375F/190C which was faster, but I thought dried it out a bit. I tried putting the chicken on a rack like the fancy cookbooks tell you, and wound up having to wash the rack and get the little bits of skin off it, which is tedious donkey work, I’m telling you. I put chili powder under the skin and beer in the pan, started the chicken breast-down and flipping it to breast-up half way through, folded the wings akimbo, tied the legs, stuffed and unstuffed. 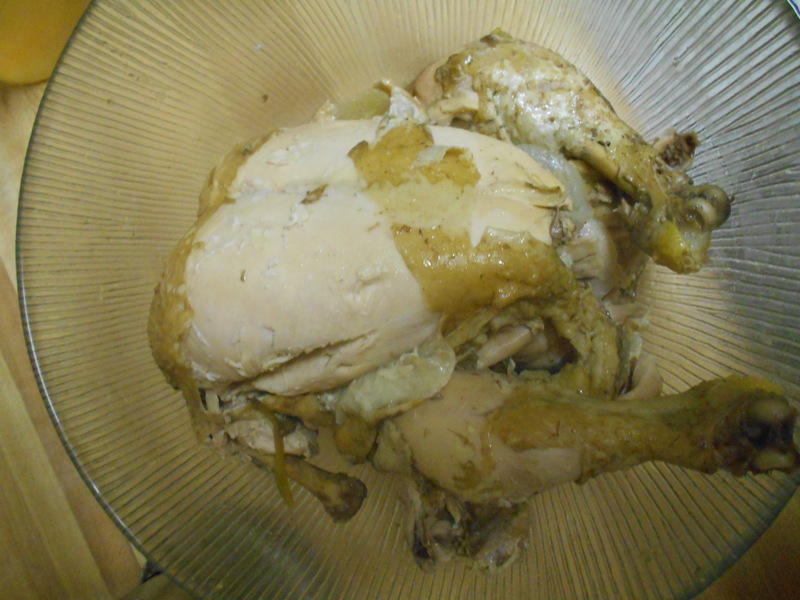 I finally came to the conclusion that the best roast chicken was also the simplest. But I also thought that maybe plain roast chicken was just… too plain, and that it wasn’t going to wow anyone except me. When I met my husband eight years ago, he liked to make pan-fried chicken with gravy, and he was proud of it. I made various oven-fried chicken dishes, and some of them were pretty good. 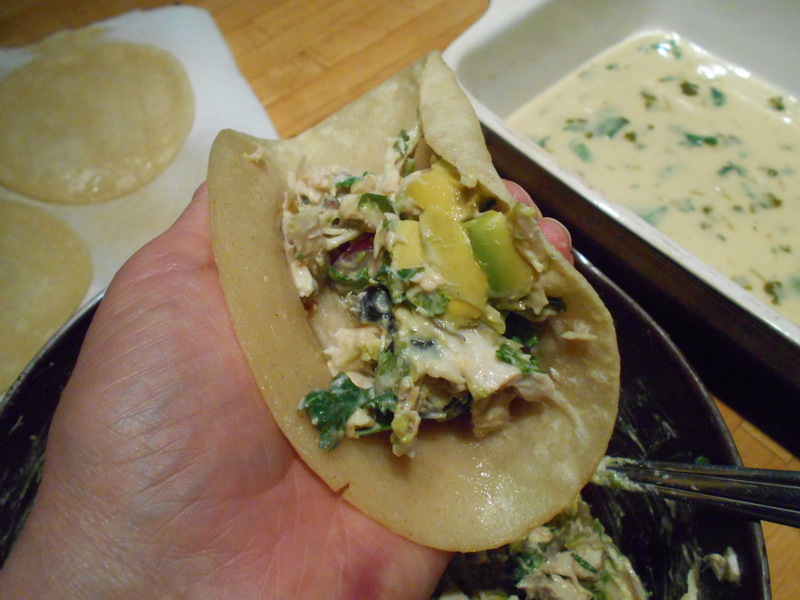 We made beer-can chicken, which is good but kind of a gimmick, and it takes forever. About two years ago I decided to make my plain roast chicken for him. 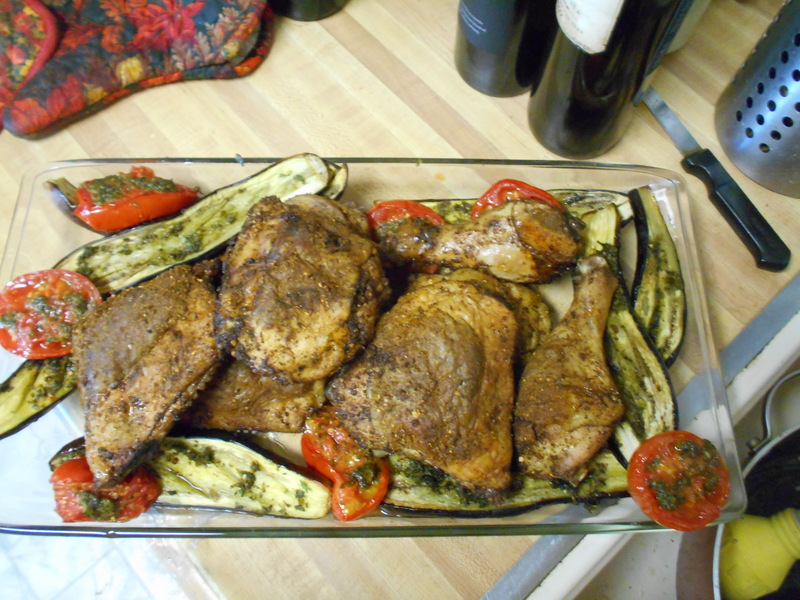 It smelled really good as it roasted… brought it to the table… served it up. He hasn’t made fried chicken since. He couldn’t believe that I had been making this for myself all these years but never for him. I think if we hadn’t already been married that it would have sealed the deal. Moral of the story: don’t reveal all your tricks at once. Hold back some of the clever things you know how to do. Bring them out when you feel like showing off. 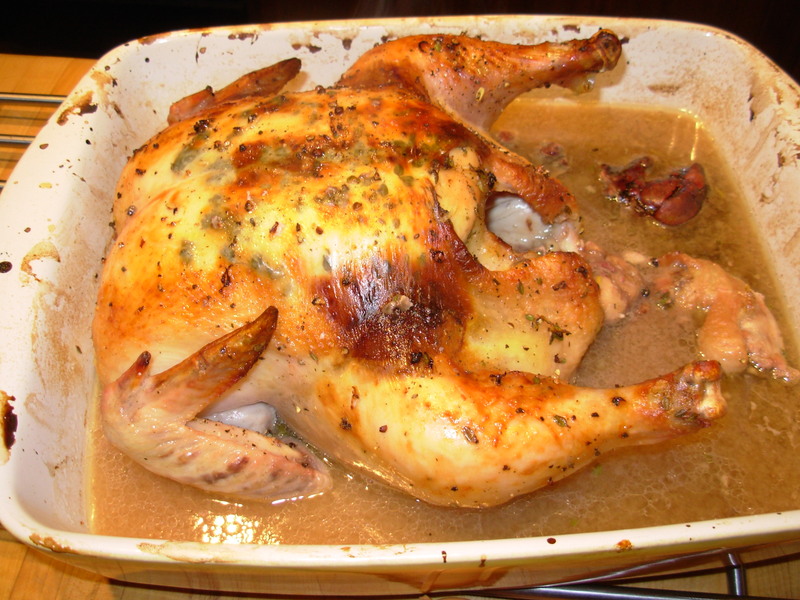 It always surprises me that people don’t make roast chicken, preferring instead to buy a packet of Shake & Bake or a jar of Chicken Tonight (do they still make that?) or pour a can of Campbell’s Cream of WTF over an innocent chicken. 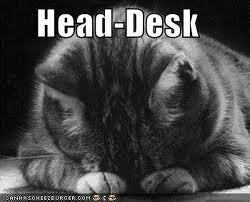 But then I look at the recipes online: Ina Garten’s recipe for “Perfect Roast Chicken” takes 11 ingredients including a bulb of fennel. Tyler Florence’s “The Ultimate Roast Chicken” involves six strips of bacon and three bunches of fresh herbs. And so on. No wonder people don’t roast chicken – they think they have to buy all this other stuff. Well, you don’t. All you need, really, is a chicken. Of course it will be a little fancier and taste a little more special with some seasonings, but really, you don’t need to run to Dean and DeLuca. And I’ve never trussed a chicken and don’t intend to start now. 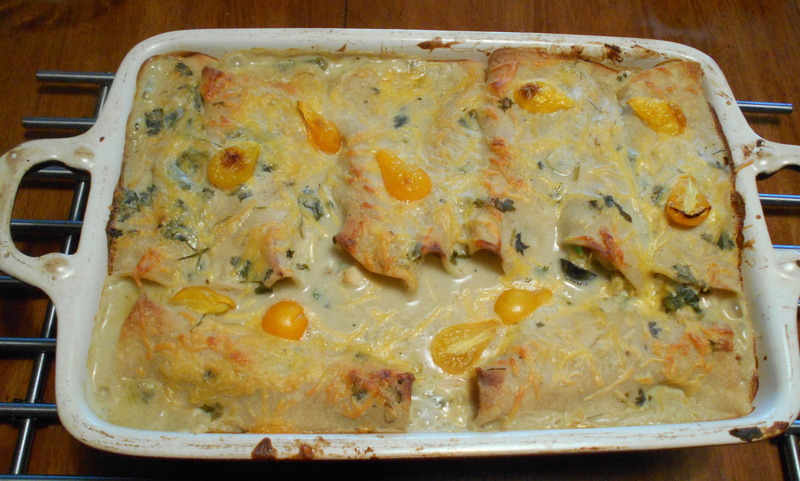 This is easy comfort food at its simplest and best but is also appropriate for a very fancy dinner. I think this is a dish aspiring cooks should learn to make: it’s the little black dress of cooking. Below: this is what I use. 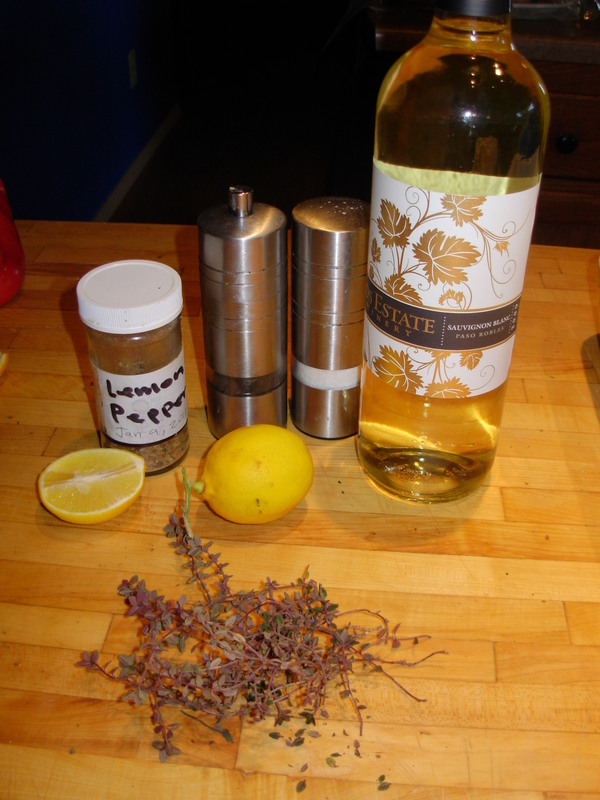 Salt, freshly ground pepper, thyme from the garden, fresh lemon, homemade lemon pepper (see previous post), and wine. But just salt and pepper would be fine too. So you’ve got a chicken, which presumably is thawed. If the cavity is still frozen, run water into it so you can remove the contents. 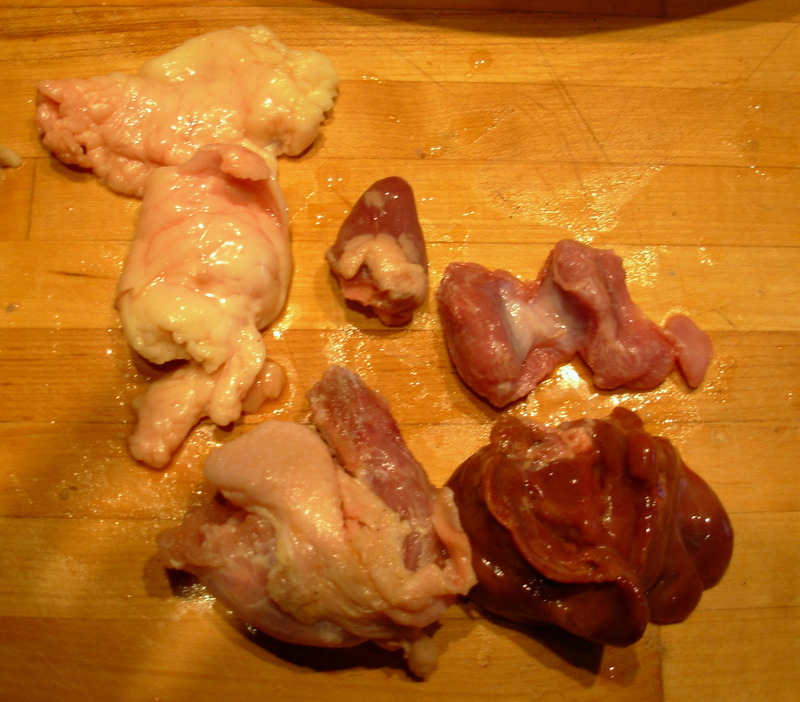 Below, clockwise from top left: fat globules pulled from the chicken’s bum, the heart, the gizzard, the liver, the neck. You can throw them away if you want. You can cook the heart, gizzard, and liver, chop them, and give them to your cat. 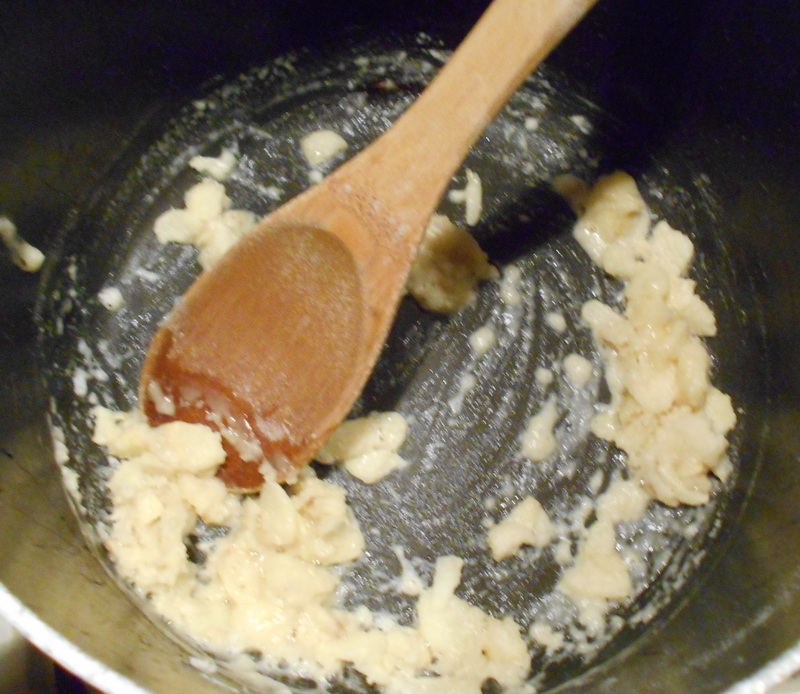 You can render the fat to make schmaltz and gribenes. 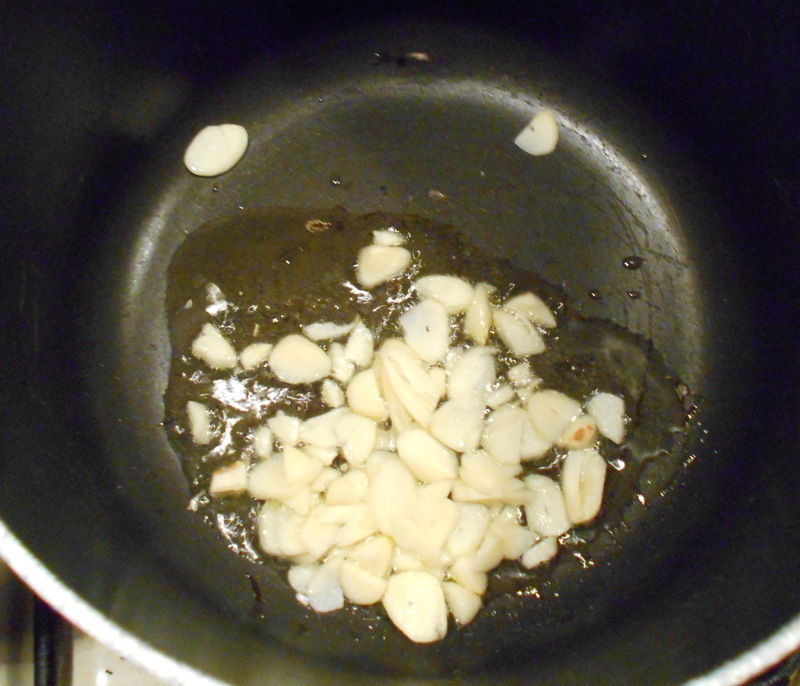 Or you can do what I do, and add them to the pan. If you’re using a lemon, rub the chicken all over with the cut side, squeezing it as you go. This will cut surface bacteria and freshen the meat – sometimes a chicken just removed from its plastic bag has a slightly plastic-y smell. (If it has an OBVIOUSLY off smell, take it back to the store pronto.) Squeeze the juice inside too. Sometimes I put the squeezed-out rinds in the cavity while it roasts. There is ample room under the skin to fit your hand (remove your rings first!) 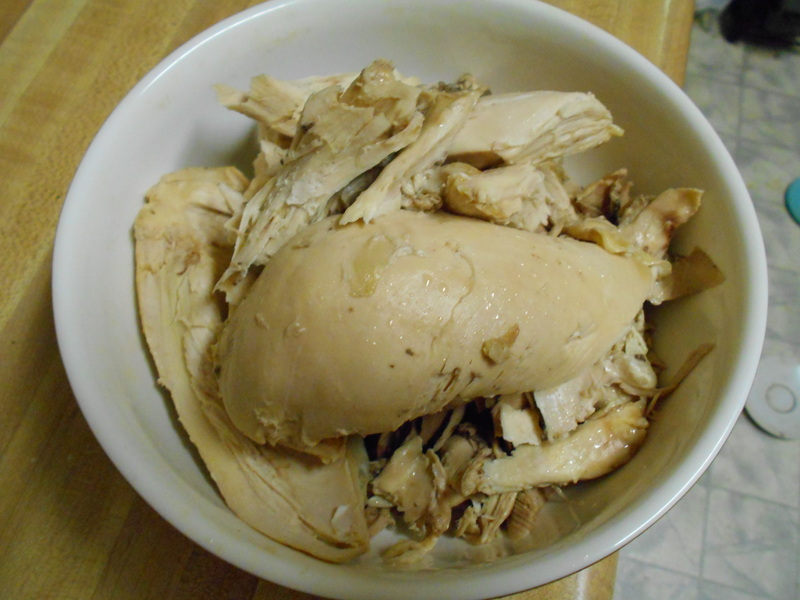 so you can easily season the breast meat – which tends to be very bland. Here I am pushing some thyme leaves under the skin. The skin is attached by a very thin membrane right down the breastbone. You can ignore it and work around it, or you can cut it with scissors or a knife, or carefully break it with your fingers. Doesn’t matter. If you don’t like thyme or don’t have any, you can use fresh minced parsley (use the flat-leaf Italian parsley; it has MUCH more flavor than the curly decorative kind), chopped rosemary, tarragon, cilantro, or whatever fresh herb floats your boat. Or don’t use any. But you probably want to rub some salt and freshly ground pepper under and over the skin, all over the chicken, including in the cavity. I also use lemon pepper here, but again, that is up to you. 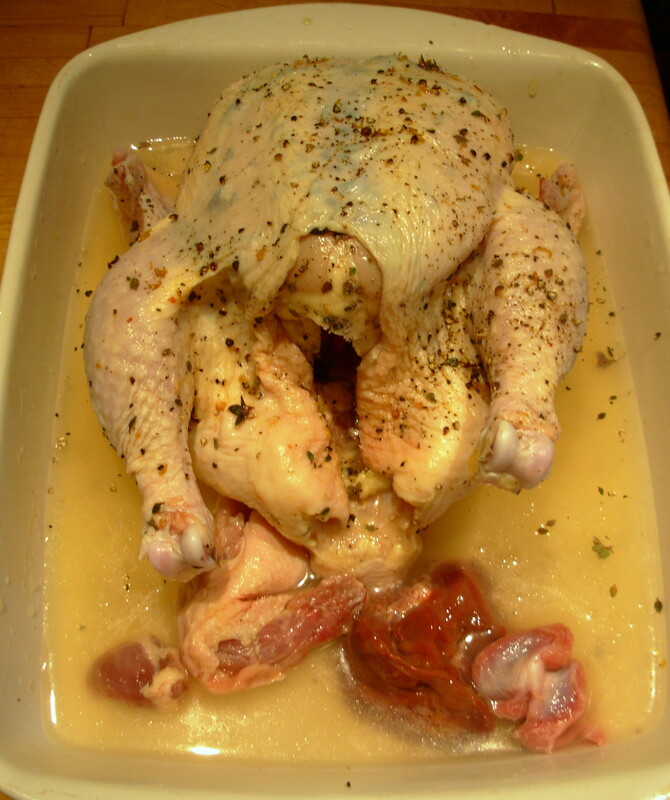 Below: a chicken all dressed up with seasonings. I’ve put the giblets in the pan and poured in some white wine. 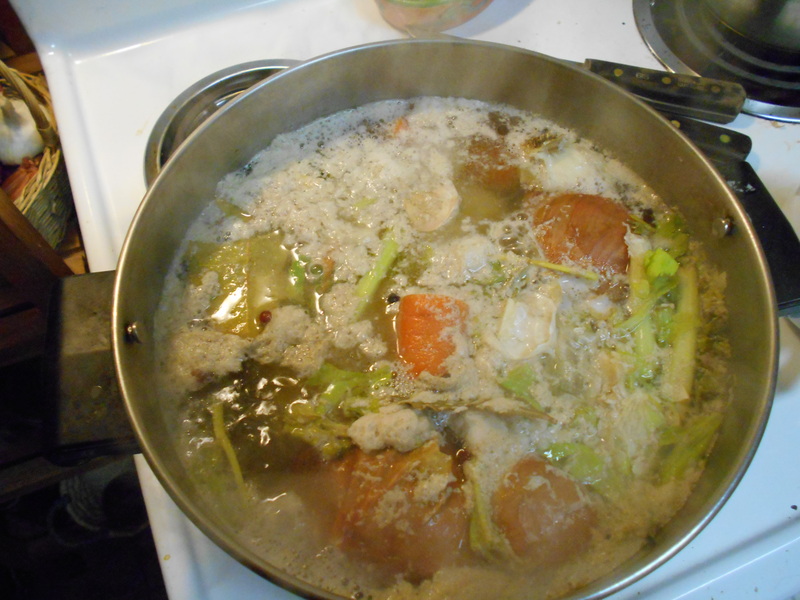 I also added a little water and some chicken broth. Use one, two, or three – or none, if you like, but I like to have a goodly amount of liquid – about 1 inch – in the pan to make gravy with after the chix is done. If you don’t, that’s fine. OK. 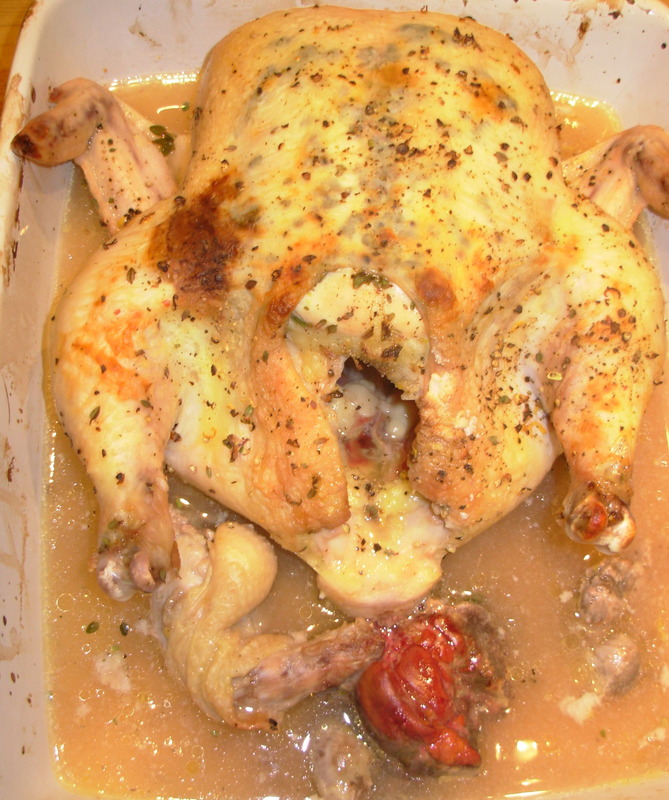 Put the chicken in the oven and set the oven at 350F (you don’t need to preheat the oven for this). Go away for a while. You can baste the chicken if you want. I do, but I’m not sure it makes any difference. It makes me feel useful, though. 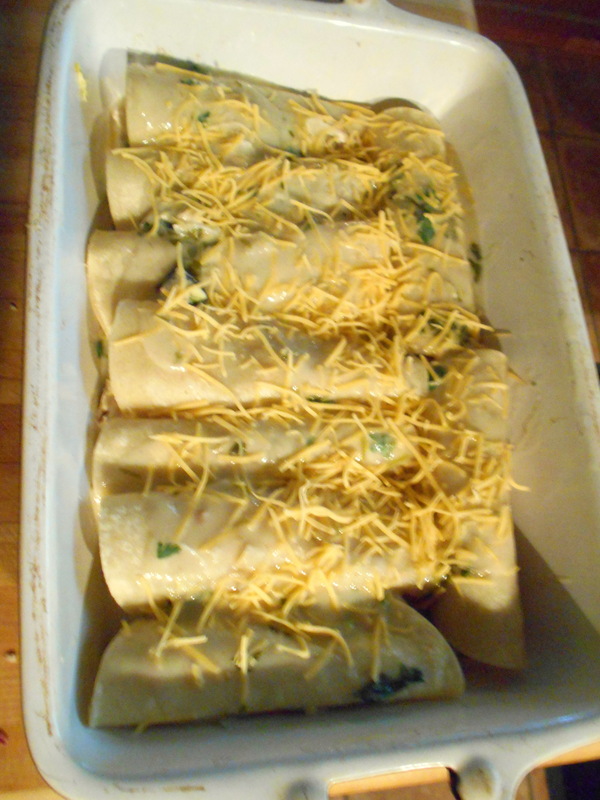 At this point I threw in some halved mushrooms because we had some that needed to be used, Certainly not required. After 1 1/2 hours, the chicken is starting to look relaxed. When is the chicken done? Most cookbooks tell you to use a thermometer, either the type that you leave in during the entire cooking process or the instant-read type, and you can certainly do this. Myself, I gauge it by the leg wiggle test: if the leg wiggles easily, it’s done. If the skin appears to be getting too dark, loosely tent a sheet of aluminum foil over it. This chicken was about 5 1/2 pounds, so it roasted about 2 hours before I judged it done. 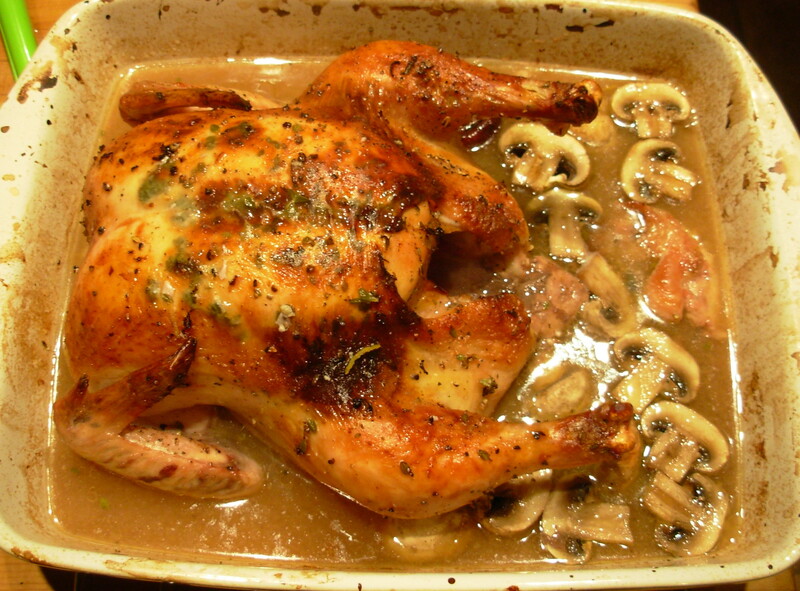 When it came out of the oven the last time, I moved it and the giblets to a plate and poured the broth left in the casserole dish into a pot so my husband could skim off the excess fat and make gravy. 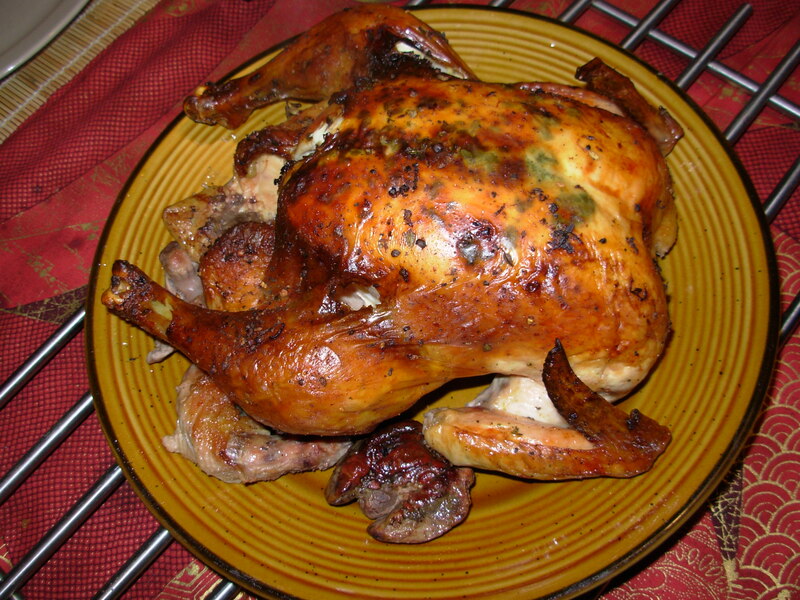 Cornish game hens are roasted exactly the same way, though they will take only about 45 minutes to an hour. And do take the plastic wrap off first. 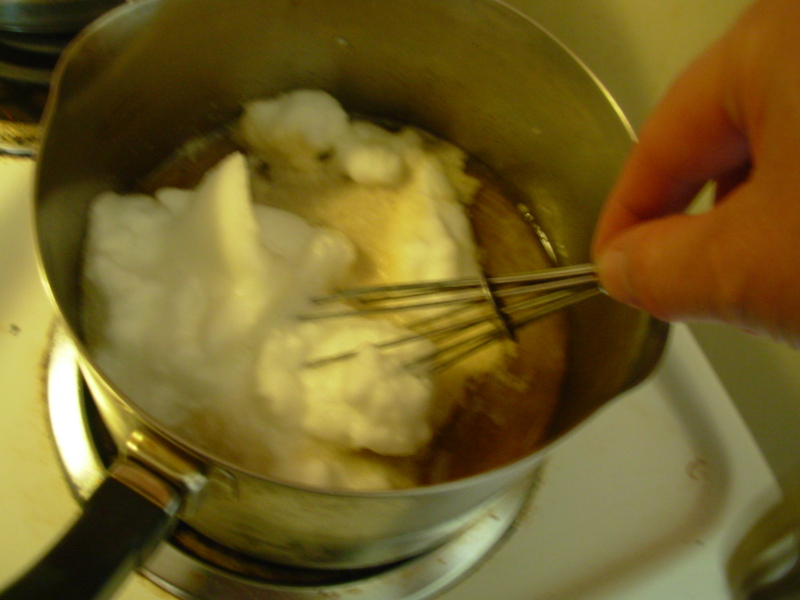 Mix 3 tablespoons cornstarch with 3 tablespoons cold water in a cup. 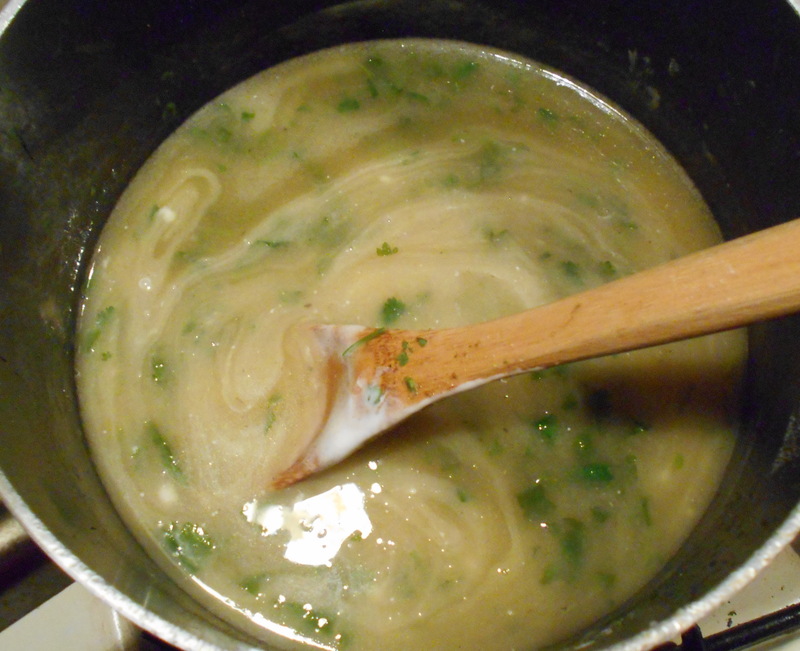 Pour the broth into a saucepan, skim off excess fat with a spoon, and heat until just starting to simmer. 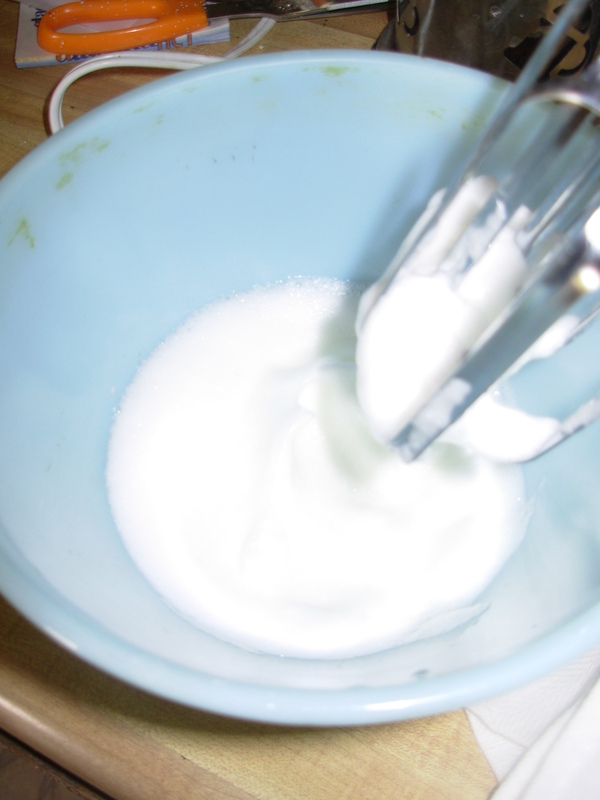 Slowly pour in about half of the cornstarch slurry, stirring constantly. Adjust the heat so it doesn’t boil hard and keep stirring. 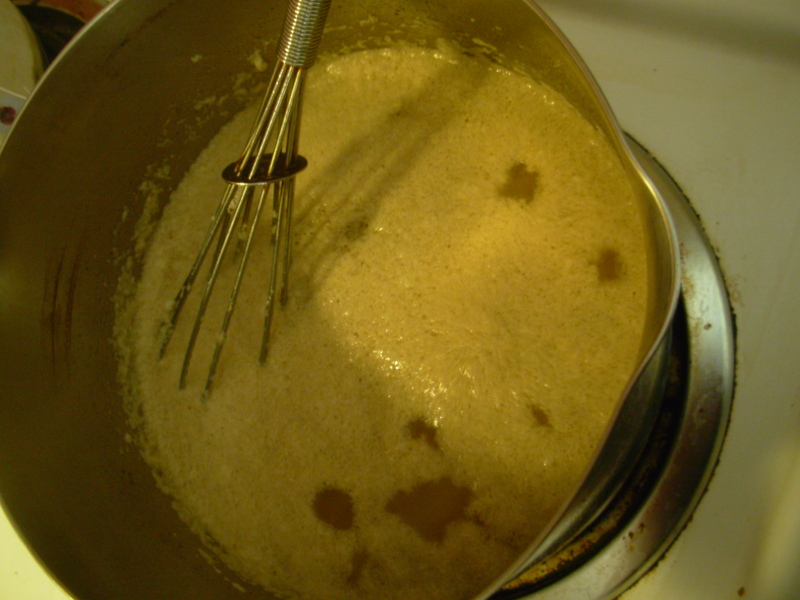 The gravy will thicken; if it isn’t as thick as you like, add more of the slurry until it thickens to your preference. Taste and add salt and pepper if necessary. 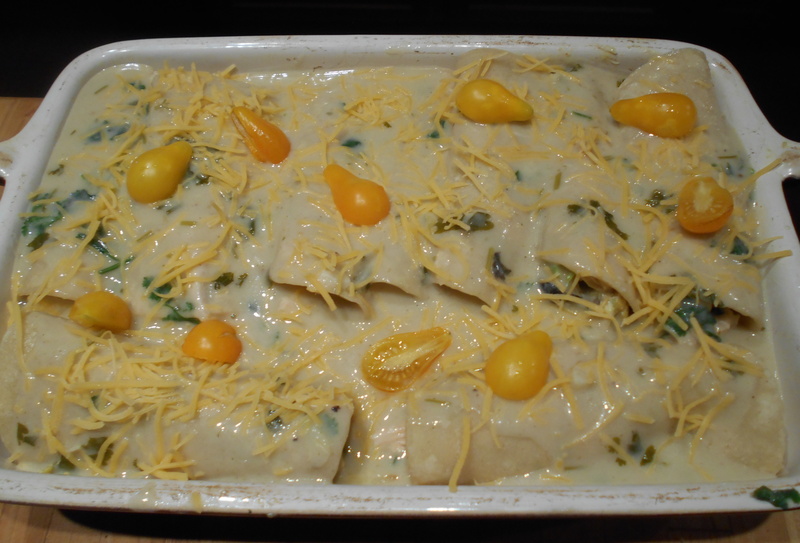 Posted in recipe and tagged chicken, gluten free, technique. Bookmark the permalink.